’Tis the season, Slashed Squad! 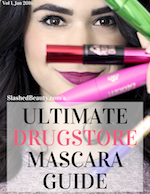 Now’s the time when we get to see the holiday collections pop up from our favorite brands. I recently received the very first one of the season, and I think it’s one you will all love! 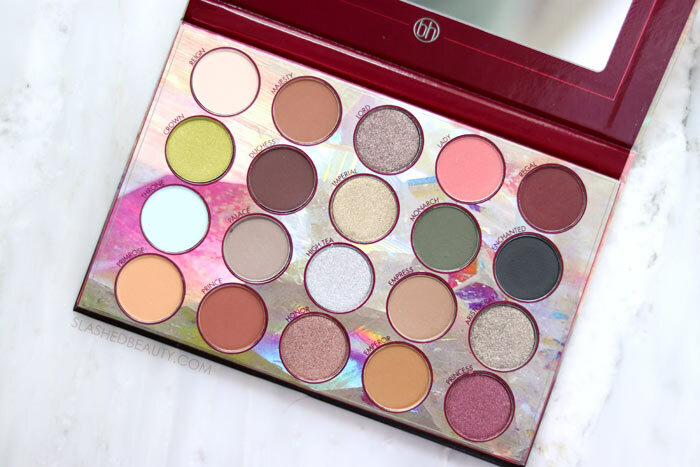 The new BH Cosmetics Royal Affair collection previewed with a few products available early on Ulta Beauty, but all of the products are now available on the brand’s website. There are five products that make up this collection including one new eyeshadow palette and a few existing products put into gift bundles. The products range from $18-$25 and make for great gifts, or treats for yourself to create holiday-ready looks! Keep reading to take a closer look at each product in the collection. First, we have the hero of the collection: the BH Cosmetics Royal Affair 20 Color Shadow Palette ($18). I was super drawn to the color scheme of this palette as soon as I laid eyes on it. We have some beautiful fall jewel tones like golds, green, mustard and burgundy, plus neutrals to help balance it out. There’s a great balance of matte and shimmer shades, and with so many colors, you can really mix and match for a variety of both everyday and bold looks. The formula is super smooth and the shades vibrant— please let me know if you want a full, in-depth review of this palette! The BH Cosmetics Royal Affair 10 Piece Metalized Brush Set ($25) would make a great gift for beginners. Brushes are what the brand became famous on, and they’re still doing them right. This brush set contains all the basics: ten synthetic two-tone brushes with style. Even though they have a luxe appearance, these are super lightweight which would make them great for traveling. Included in this set: tapered powder brush, large contour brush, large flat top buffing brush, angled blush brush, large crease blending brush, tapered crease blending brush, detailing crease blending brush, tapered concealer brush, flat shader brush, and an angled liner brush. 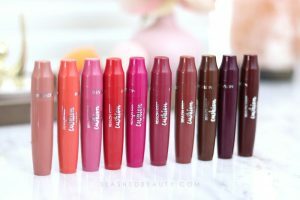 Next, we have a bundle of five Liquid Linen Lipsticks— I reviewed these lipsticks a couple months ago, you can see swatches of all the shades (including two in this set) and more information about their performance right over here. The BH Cosmetics Royal Affair 5 Piece Liquid Linen Lip Color Set ($24.50) not only includes the five lipsticks, but a really cute double-sequin bag with a pom pom zipper. You can use it for beauty on-the-go, or even as a pencil case. The shades included in this set are Maria, Carin, Vania, Simone, and Stephanie. Vania, Simone and Stephanie are all new shades exclusive to this set, it seems. Vania is a deep mauve rose, Simone is a deep raspberry and Stephanie is a mid-tone chestnut. While I’m typically not a huge fan of glitter, that definitely changes around the holiday season, the season for sparkle! So one of my favorite items in this collection is the BH Cosmetics Royal Affair 3 Piece Glitter Set ($19.50). Not only do you get another small sequin bag, but three full size Glitter Collection jars in the shades Gold Rush, Warm Espresso, and Lit. 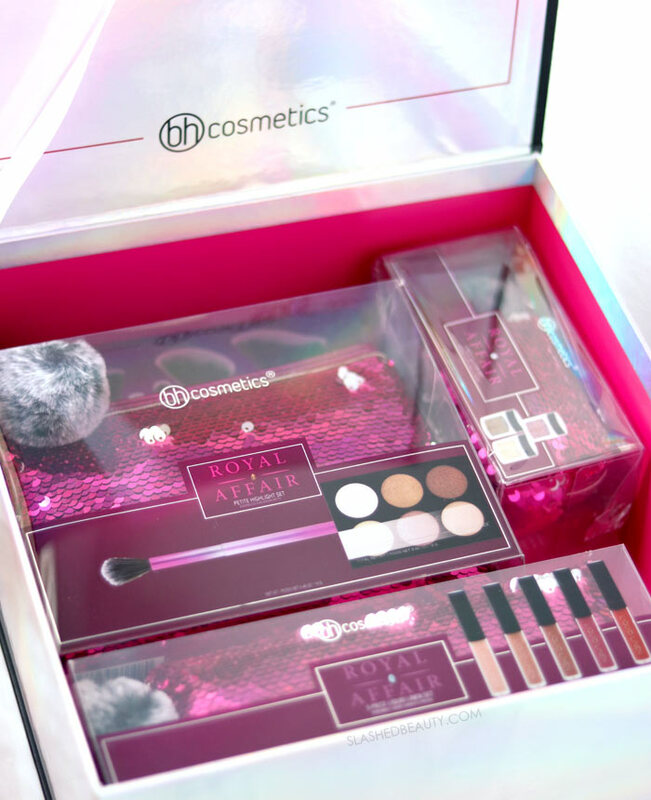 Finally, we have the BH Cosmetics Royal Affair Petite Highlight Set ($22.50), which isn’t really all that petit. 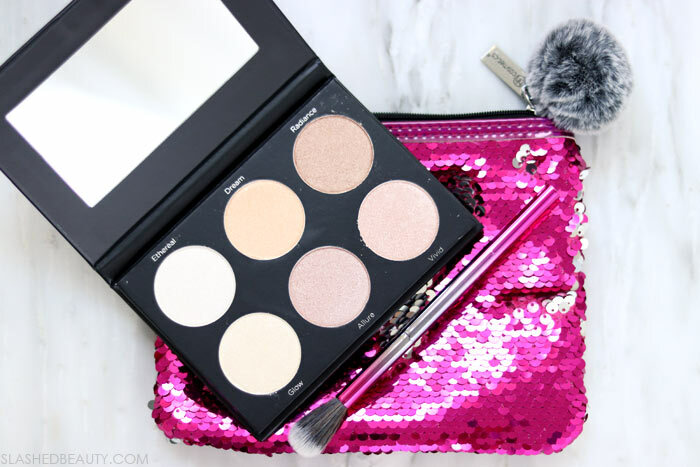 We have the largest sequin bag that houses the Spotlight Petite Highlight 6 Color Palette, plus a highlight blending brush! This one is definitely for the glow-getters out there who love to steal the show with a strong highlight. Whether you’re starting your wish list, shopping for yourself, or picking up a gift for a friend, the BH Cosmetics Royal Affair Collection has something every beauty lover will appreciate. Check out the collection in full on their website! Have you started to shop for holiday beauty gifts yet? I completely agree with you the shadow palette looks amazing and the colors are perfect for the name for the collection. 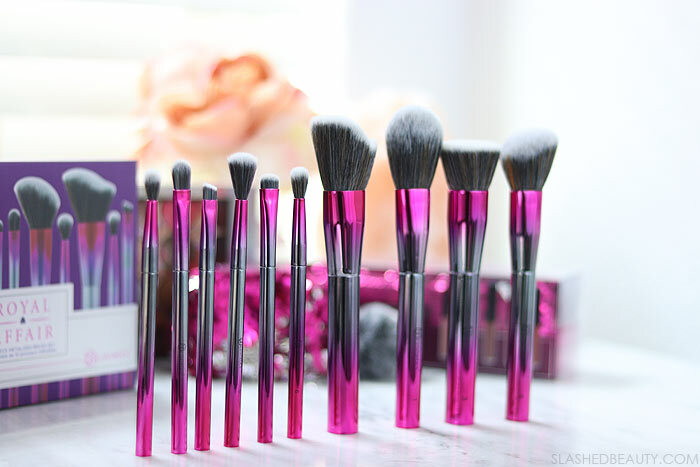 I also love the brush set, I’m not sure I actually need more brushes at the moment, but these are just so cute. I am already adding these items to my holiday wishlist.